Drawing several thousand people each year, Winterblast is promoted with posters, social media and word of mouth. A poor-man's-Mardi-Gras with street vendors, bands, artists, performers and local color — Winterblast is an annual street festival in Santa Rosa's SOFA arts neighborhood. For this year's poster I asked the talented photographer, Collin Morrow, to interpret the event with a work of art. 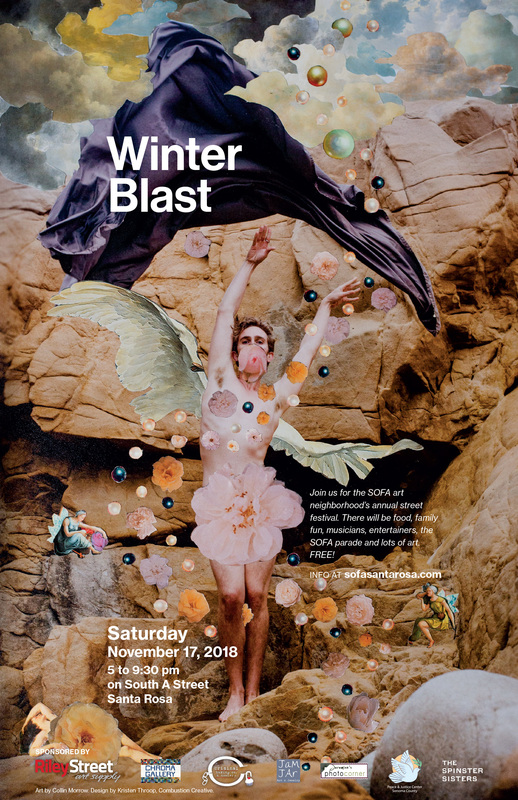 I was thrilled to use his photographic collage for the most recent Winterblast poster. Thank you to Deependra at Clone Digital Print and Copy in Santa Rosa for printing the posters. Whenever you're thinking of going to Kinko's, go to Clone instead and support a local business.